Crazy week at work. We’ve all had those, right? Well, somehow, I got the easy assignment on Thursday night. A co-worker and I loaded up and headed to Grand Haven for a couple of hours. I was with a guy I don’t work with very often, but I like when I do. He always makes sure we get dinner…and it’s very rarely anything but a local joint. We were looking for a deli that he thought he had seen somewhere, but we never could find it. I drove downtown hoping to find a sandwich shop we could hit up real quick either near the lake or on the main drag. We were really close to giving up and going to Culver’s when I noticed a familiar sight. 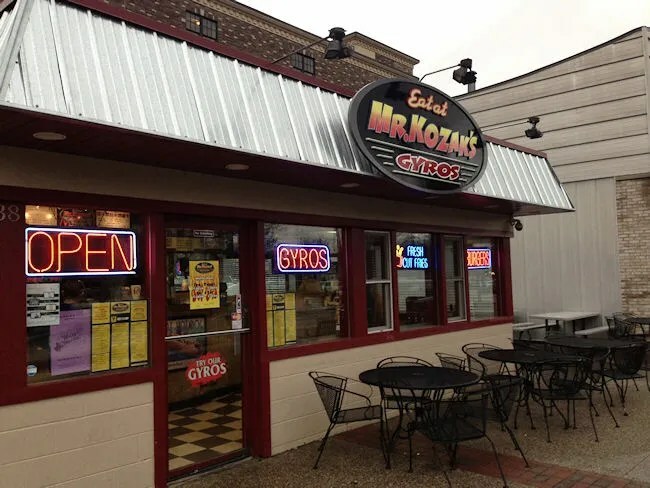 Mr. Kozak’s Gyros sits in downtown Grand Haven at the corner of Washington and 1st Street. It’s an old ice cream shack that a family from Chicago turned into authentic Chicago-Style food. The building is really small with no tables. There is a counter along the window with some bar stools and a lunch counter type deal next to the cash register that also uses bar stools. The menu is classic Chicago style. Beef, hot dogs, and gyros among other things. I had actually eaten at a sister restaurant with the same name in Holland quite a while ago, so I knew what I was getting in to. Co-Worker had never been to nor heard of the place, but he saw the Vienna Beef sign hanging in the window and knew it would be good. Co-Worker went with the Gyro, a small fry and a Diet Coke. I’m not a Gyro fan myself, but he said it was very good. The tzatziki sauce is home made and made fresh daily. The meat is “top quality” (not sure what that means) and there was plenty of it in the pita. I knew before walking in the door what I wanted. 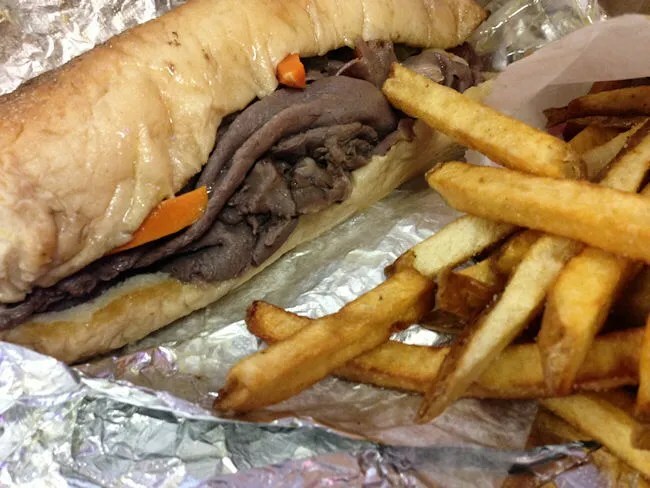 I ordered the Italian beef, dipped, with hot peppers, a small order of fries and a large Coke. The sandwich is served on a poppy seed hoagie roll with authentic Chicago hot giardinera. The beef seemed a little too thick and a little too pre-packaged, but it was still good. The giardinera really kept the sandwich together. The fries are really the best part about a meal at Mr. Kozak’s. The Idaho potatoes are fresh cut daily and deep fried to a crispy golden brown. I only got the small fry and I regretted that almost immediately. The fries were delicious. The bill for each meal was around $9. 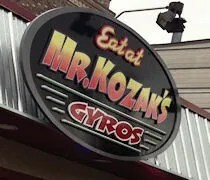 Mr. Kozak’s delivers on the Chicago Style food in this tourist town. The restaurant is open all year long and on weekends, they stay open later than the bars. Grand Haven is swarming with Chicago tourists during the summer months and they will find a little piece of home in this small corner restaurant. The rest of the year, there are Chicago transplants like myself always look for a little taste of home.